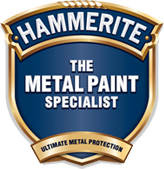 Hammerite offers specially formulated paints to be applied directly onto all kinds of interior metal surfaces. You will be amazed once you discover the possibilities. Metal furniture looks great around the home. Co-ordinating several items by painting them creates a united colour scheme. If you have an item which needs to be revamped, whether it is rusted, has flaking paint or a colour change is needed, then Hammerite is ideal.